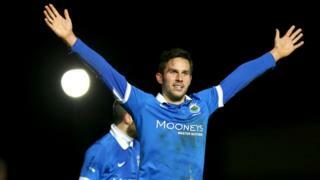 Linfield take over at the top of the Irish Premiership by beating Ballinamallard United 3-0 at Windsor Park. All the goals came after half-time with Aaron Burns scoring two and Andrew Waterworth making it three with the last kick of the game. Warren Feeney's Blues are a point clear of Cliftonville and Portadown.